Faculty member Terry Voldase participates in a survey conducted by students in Professor Sharmila Sen's English class. Cultural codes were the focus of this group activity. An interview game gave students a chance to tell their classmates a little more about themselves. 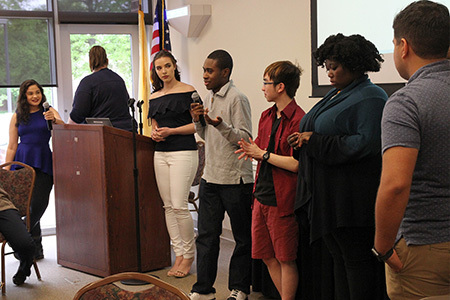 West Windsor, N.J. – Students participating in American Honors at Mercer had an opportunity to share a semester’s worth of knowledge at their Honors Symposium on May 12 at the MCCC Conference Center. 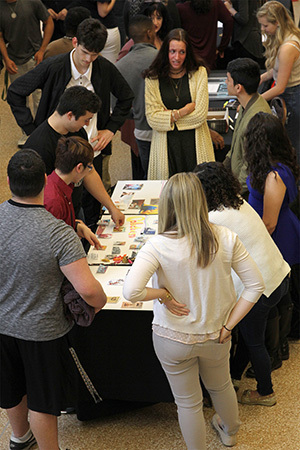 The first portion of the event took place in the Atrium, where students presented colorful posters and engaged classmates and faculty members in interactive activities and surveys. Students taking English, sociology and biology courses tackled topics ranging from gender identity and racial stereotypes, to the American prison system, climate change, and differentiating real news from fake news. Students then gathered in the Conference Center dining room, where they enjoyed breakfast and additional interactive activities, including interviews with students and faculty and the viewing of a humorous video by students in Professor Kathi Paluscio’s Public Speaking course. In his remarks to the group, Vice President for Academic Affairs David Edwards applauded students for taking on serious intellectual challenges. 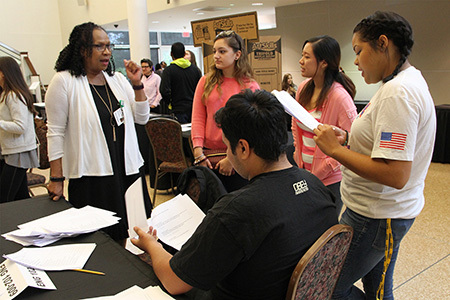 “These critical thinking skills will serve you well as you pursue your associate degrees, your bachelor’s degrees and beyond.” Honors Program Coordinator Bettina Calouri (English) added her congratulations to students for a job well done.